Forthcoming: Visual excerpts of the project “Proposal for a Rubble Archive” will appear in the forthcoming issue of Room One Thousand (UC Berkeley Department of Architecture). Forthcoming: A revised and expanded version of the essay "On Archiving Rubble" will appear in the forthcoming issue of Future Anterior, a peer-reviewed journal on the history/theory/criticism of historic preservation (Columbia GSAPP). June 13-15, 2018: Leen was invited to present the paper "On Archiving Rubble" for the Tangible – Intangible Heritage(s): An Interplay of Design, Social and Cultural Critiques of the Built Environment conference organized by the Architecture Media Politics Society in London, UK. (Declined). 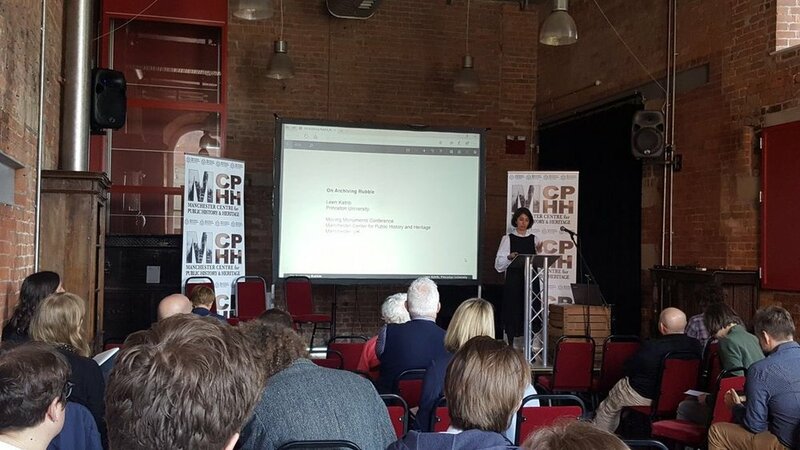 April 21, 2018: Leen presented the paper "On Archiving Rubble" at the Manchester Center for Public History and Heritage in the UK for the Moving Monuments conference that brought together historians, museum curators, sociologists, architects, artists, and PhD candidates. April 13, 2018: Leen will present Rubble Archive in a public gallery talk with invited critics David Joselit, Laurel Broughton, Tatiana Bilbao, Lucia Allais, and others at Van Der Plas Gallery in New York 12-6pm. April 11, 2018: Leen will interview Gastón Gordillo, professor of Anthropology at the University of British Columbia and author of Rubble: the Afterlife of Destruction. April 7, 2018: Leen will present Rubble Archive in a public gallery talk with invited critics Anna Neimark, Ellie Abrons, John McMorrough, Erin Besler, Eric Höweler, Sylvia Lavin, and others at Van Der Plas Gallery in New York 12-6pm. April 6, 2018: Leen will present Rubble Archive in a public gallery talk with invited critics Dean Mónica Ponce de León, Sylvia Lavin, Stan Allen, Paul Lewis, Spyros Papapetros, Jesse Reiser, Dean Amale Andraos, Eva Franch i Gilabert, Aleksandr Mergold, Ivi Diamantopoulou, and others at Van Der Plas Gallery in New York 12-6pm. April 6 - 20, 2018: Rubble Archive exhibited in the show Nine Constructionists at Van Der Plas Gallery in New York. Public access hours Tuesdays - Sundays 12-6pm. March 23, 2018: Leen interviewed Jorge Otero-Pailos from Columbia University GSAPP. March 9, 2018: Leen interviewed Elka Krajewska, the founder of Salvage Art Institute. November 20, 2017: Leen interviewed Roger Michel Jr from Institute for Digital Archaeology at the The Architecture of Memory panel discussion at The Council on Foreign Relations in New York. October 20, 2017: Leen was invited to give a Pecha Kucha presentation of her work, including the introduction of Rubble Archive, at the Soros Institute - Open Society Foundations in New York, along with Mariangela Lisanti, Konstantin Soukhovetski, David Noah, and Cesar Francia.